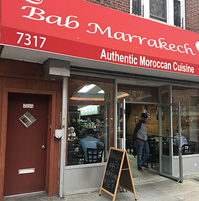 Bab Marrakech is a gathering place for a traditional Moroccan meal in Bay Ridge, Brooklyn. It’s also a place where the cook or owner might also be your server. And where the food is the true reward. Tagine is the specialty of the house served on a ceramic plate with a funneled lid to capture the steam. Braised lamb shank and chicken are cooked until the meat literally falls off the bone. At Bab Marrakech, tagine is available with roasted potatoes, marinated prunes or couscous with chick peas. It's finished off with slices of toasted almonds. Dried black olives and a thick round of bread, perfect for sopping up any juices, are also offered. The menu also features a nice assortment of kebabs and meat pies, called Bestilla. The kefta kebabs, with Moroccan herbs and spices, are particularly good. A stroll to the back of the restaurant reveals an assortment of Moroccan desserts, including almond cookies and msemmen, similar to pancakes, that are drizzled with honey.